A parliamentary report of 1777 recorded a local workhouse in operation at Guisborough (for up to 14 inmates), Marske (6), and Skelton (40). Small establishments also operated at Brotton (7 paupers) and at Commondale and Danby (4 paupers each). 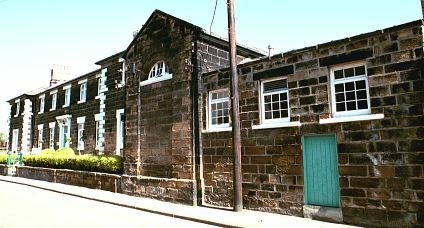 According to (Chadwick, 1996), the Guisborough workhouse, "an old tumbledown cottage", was "no regular workhouse but a house for the reception of paupers". A paid manager was employed by the parish's Select Vestry to run the establishment but it appears not have been a popular job. Apparently, one lame Guisborough pauper seeking relief was "offered" the post under threat of his allowance being stopped if he refused. Another 75-year-old found it so demanding that he cut his own throat. In 1814, Danby erected a new workhouse under Gilbert's Act of 1782. It was a substantial stone building costing £1,007 accommodating up to 50. In the same year, the nearby townships of Hinderwell and Lythe followed suit and formed a Gilbert Union which was joined by Loftus and Easington in 1818. A house on the High Street in Loftus is said to have been used as a local poorhouse. North Riding of Yorkshire: Brotton, Common Dale, Danby, Easington, Eston, Guisborough (2), Hutton Locras, Kilton, Kirkleatham, Liverton, Lofthouse [Loftus], Marsk, Great Moorsham, Morton, Newton, Normanby, Ormsby (part of), Pinchingthorpe, Redcar, Skelton, Skinningrove, Stranghow, Tocketts, Upleatham, Upsall, Westerdale, Wilton. The population falling within the Union at the 1831 census had been 11,038 with parishes ranging in size from Morton (population 26) to Guisborough itself (1,988). The average annual poor-rate expenditure for the period 1834-36 had been £4,984 or 9s.0d. per head of the population. In its early years, the Guisborough Board of Guardians was effectively under the control of the local Dundas family, with Sir Robert Dundas MP as its Chairman. At a meeting of the Guardians in August, 1837, a proposal that the union workhouse be located at Guisborough was defeated by one vote, but two months later a majority vote reversed this decision and a building committee was set up to identify a suitable site and plans. Money to help finance the building was raised by selling off existing parish properties used for poor-relief purposes. These included cottages, garden and outbuildings at Moorsholm, and two cottages described as a 'workhouse' at Danby dating from 1815 — the latter continued in use as the union workhouse until May, 1839. A new Guisborough Union workhouse was erected in 1838-9 on the corner of Northgate and what is now Church Lane. It cost about £2,629 and could accommodate about 130 inmates. It was designed by John and William Atkinson of York who were responsible for a number of other Yorkshire workhouses including Bedale, Beverley, Easingwold, Goole, Howden, Pocklington, Skirlaugh and York. The workhouse location and layout are shown on the 1914 map below. The main building was two storeys high, with single storey wings. Guisborough main block from the north-west, 2001. Guisborough main block from the south-west, 2001. The original sick wards were in a separate block at the north of the site. Guisborough sick wards from the north-west, 2001. In 1893-4, a new 48-bed infirmary was erected to the south of the workhouse. It had separate male and female entrances at either side of the central block. A nurses' home was added nearby in 1912. Guisborough 1894 infirmary and 1912 nurses' home from the south-west, 2001. For its first ten years, the new workhouse was somewhat underused, with the average number of inmates being about 30. By 1867, the average occupancy had risen to about 90. Male and female vagrant wards were erected in 1842. Prior to this date, vagrants had been given tickets for beds at local lodging houses, or money to buy food. In the vagrant wards, inmates were given a night's lodging and then required to perform three hours work before leaving — two hours before breakfast and one after. Women did oakum-picking and men stone-breaking. 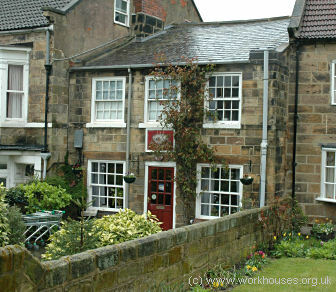 Guisborough appears to have been regarded as a model workhouse by the Assistant Poor Law Commissioners who visited it. It had water closets (then a novelty) and a slipper bath. It had a piggery, a garden field, and a small orchard, and the inmates grew and sold large amounts of potatoes and cabbages. The workhouse was well maintained and the inmates, who slept on coconut fibre beds, were regularly shaved, shorn, and provided with bibles, prayer books and literature from the Society for Promoting Christian Knowledge. When it came to work, able-bodied men were required to break half of ton of stone a day in winter, and three-quarters of a ton in summer. Boys aged 10 to 16 broke a quarter of a ton. Females were occupied in domestic work or oakum picking. Boys in the workhouse attended the local Providence School when they were old enough. Before the first (unqualified) schoolmistress was appointed in 1846, the girls were taught by a female vagrant. A local clergyman conducted services in the workhouse dining-hall. In 1875, the Guisborough Union lost the townships of Eston, Ormesby and Normanby to the newly formed Middlesbrough union. 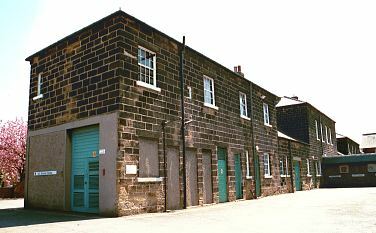 In 1886, a dispute arose over the running of the Guisborough workhouse which six months later resulted in the resignation or sacking of nearly the whole staff. Numerous charges and counter-charges were made involving the Master and Matron, the Schoolmistress, the Porter, and the Industrial Trainer. The Master was initially given a vote of confidence by the Guardians in his claims that the Schoolmistress disobeyed his orders, displayed violent tempers, and fostered dissatisfaction amongst the inmates. In turn, the Master, it was claimed, kept 30 or 40 hens at the workhouse, and sold their eggs for his own profit. In January 1887, a six-day enquiry by the Local Government Board resulted in the Guardians being forced to demand the resignation not only of the Schoolmistress, but also of the Matron and Master and the Porter. In addition, an Assistant Matron and the Head Nurse resigned. In the 1920s, the Master and Matron arranged dances in the workhouse dining-hall to which local townsfolk were invited. These usually took place on Tuesday evenings with women inmates helping with the supper. The money raised was often used to take children from the union homes on holiday to Marske or Redcar. The dances were stopped after one of the Guardians complained that public money was being spent on them, electric light was being used, and the stove was kept on until ten o'clock. After the First World War, the workhouse became Guisborough Poor Law Institution then during the Second World War accommodated military patients from Catterick and Whitby. Construction of a new maternity unit began in the second half of 1944 and opened in the following spring. After the inauguration of the National Health Service in 1948 the site became Guisborough General and Maternity Hospital and then Guisborough General Hospital. Many of the original workhouse buildings still survive. The Guisborough Union established several homes for pauper children. These included one on Back Lane North in 1913, replaced by another on Blocklow Street in 1921. In 1924, the Blocklow Street home could house 24 children, with F. Riches as its Superintendent. Children were also sent to a home in Grange Road, Middlesbrough. Many boys went on from the homes to the training ship Wellesley at Newcastle. Teesside Archives, Exchange House, Exchange Square, Middlesbrough TS1 1DB. Admissions and discharges (1837-1930); Minutes and ledgers (1837-1930). Guisborough Union Workhouse by JJ Turner (Leeds University Department Adult and Continuing Education, 1984).